Fresno State physicist Ray Hall has amassed over 1 million Instagram followers by posting videos of educational physics toys. When you think of Instagram celebrities, the Kardashians and performers like Beyonce probably come to mind. But with the Instagram handle @PhysicsFun, one of Fresno’s own scientists recently reached a million followers. He has almost as many as the astronaut Scott Kelly, and even more than celebrity astrophysicist Neil deGrasse Tyson. 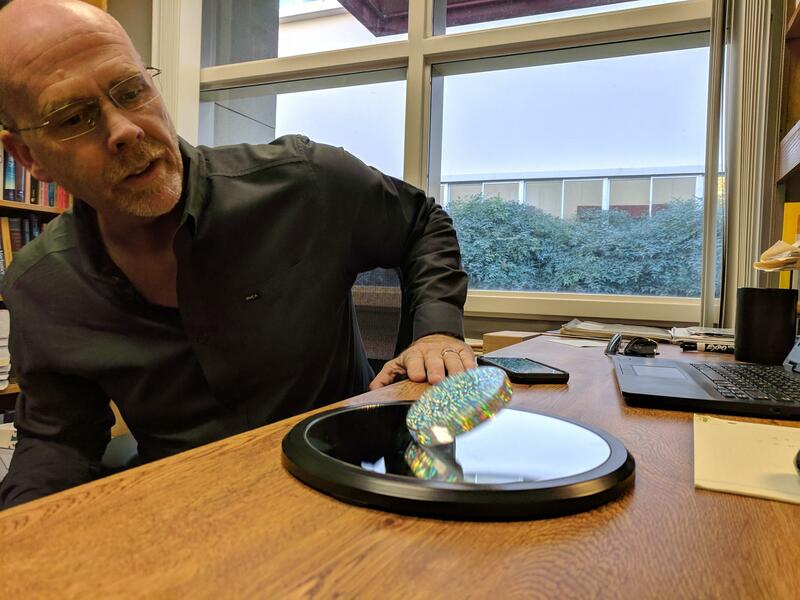 Ray Hall demonstrates Euler's Disk, a toy that, like a quarter spinning and coming to rest on a tabletop, exhibits a spinning-rolling motion called "sprolling." Ray Hall, a physics professor at Fresno State, will be speaking about his work and social media celebrity status on December 3 at a monthly event in Central Fresno known as Café Scientifique. Listen to the interview for a preview of his talk, in which he explains how he built a massive online following around videos of curious physics toys.